23' custom aluminum pilothouse restore. Builder??? GRAYLIGHT (newly named) is a custom, double hulled 23' aluminum pilothouse that was originally born in the Pacific Northwest as a harbor patrol boat back in 1989 (this is what we have been told by the previous owner, and the boat has changed hands at least 5 times since new). Naturally she came to us pretty used and abused but we fell in love with her immediately and knew this was the investment we were looking for. I have contacted numerous manufacturers in the PNW trying to find the builder, but nobody has claimed her yet. As suggested by "Omakase" on another fishing forum, he recommended I join this forum and reach out to you guys. If anybody has a clue who manufactured her, I would greatly appreciate it. The DIY part of this restore was countless hours of sanding, grinding, and painting her inside and out. Painting this girl just about killed my partner and I and I'm not sure I would recommend taking on a project like this unless you're 100% committed from start to finish. We also added new trim tabs (nautilus smart tabs sx), custom kicker mount and Nissan kicker motor, racor 60 gph fuel separator/filter, fuel sender, 2 new bilges (auto and manual), 3 way bilge switch, hasp lock, door magnets, fans for pilothouse, powder coated the bench seat, deck hatch, new batteries, and a life ring (among other safety items). We repowered her with a BF 225 Honda last week. She absolutely flies! Specs so far are 25 knots at 3400 rpms and 40 knots at 4800 rpms. We couldn't even redline her since she was chine walking (and squirrelly) at 4800. Although she appears way overpowered, the sea trial was done with only 2 guys (we typically fish 3-5), and no bait tank filled (375 lbs of water normally). Hoping to be a regular on this forum now that I switched over from NON ALLOY (2 previous Boston Whalers) to our new aluminum boat. Re: 23' custom aluminum pilothouse restore. Builder??? not sure who the builder is but looks like an awesome fishing machine. the 225 dwarfs the original engine by the looks of things. That is an awesome boat!!! Hey Welcome and thanks for posting pics of your boat. I would bet dollars to doughnuts that eventually someone will figure out who built you boat. Cool project--thanks for sharing. That hull looks real familiar, is there a HIN# on the transom? Thanks for the replies so far guys. Unfortunately there is no HIN or any identifying marker anywhere on the boat. Here's a few more pics of the restore/repower at different angles, perhaps someone will recognizer her. What did your Washington title document say for builder? My title (from California) says "SPCNS" which is short for specialty construction. I believe this is the generic label on a title for a boat/trailer/vehicle with no specific make or model. 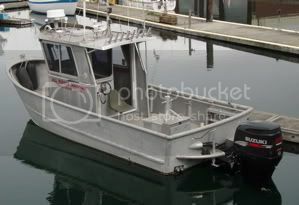 Like I mentioned earlier, this boat has changed hands at least 5 times and the only story that I got is that it was originally made in the PNW and used for a harbor patrol-related duty. I can't even verify the validity of the story except I tracked down the previous 2 boat owners and they said the same thing.